One of the best things about owning a KitchenAid stand mixer is that it can do so much more than just mix cookie dough. Thanks to the wide array of attachments and add-ons available it’s an incredibly versatile appliance. In addition to specialty mixing attachments, there are plenty of extras that don’t use the bowl, instead they use the motor of the mixer to perform another kitchen task. The attachments range from fun add-ons, like the ice cream maker, to practical attachments, like the slicer/shredder/grinder set. While the attachments won’t replace every appliance you own, they can save you storage space and earn your stand mixer a permanent spot on your counter. 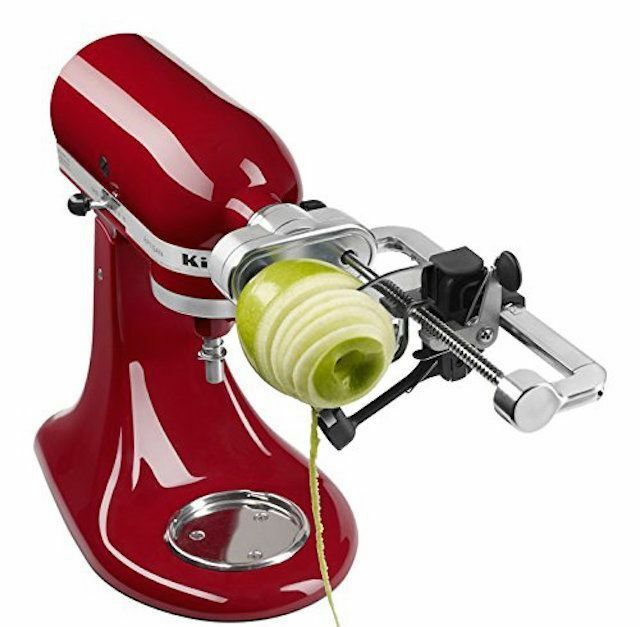 Even better, since KitchenAid mixers are so popular, there are new attachments being introduced regularly both by KitchenAid and other companies. Most of the attachments are designed to work with every model of KitchenAid stand mixer, but it’s good to make sure it will work with your machine before you purchase. Since there are a few attachments that are specific to tilt-head or bowl-lift models. Some of the attachments can put a strain on the KitchenAid motor, so it’s a good idea to make sure it’s not getting too hot, and to shut it off and give it a rest if the motor is straining to complete its task. With all that in mind, here are the top attachments on the market today. If you love spiralized vegetables, adding a spiralizer to your KitchenAid stand mixer makes a lot of sense. Like other attachments, it connects to the hub, and it fits all current KitchenAid stand mixer models. This comes with four blades (two slicing and two spiralizing) that swap in and out easily, and a peeling blade can be used at the same time, or just peel without slicing or spiralizing – great for peeling lots of potatoes. All of the blades are top-rack dishwasher safe, and all of the parts store neatly in the included storage case. Unlike other attachments, this one doesn’t add any functions to your stand mixer, but it does make mixing more efficient. The soft rubbery edge scrapes the sides of the bowl as you mix, so you won’t need to stop during mixing to make sure everything is well combined. This shouldn’t be used to mix thick batters with hard ingredients that could damage the rubber edge, like cookie dough with nuts. This beater fits the tilt-head mixers, but you can also get one for bowl-lift style mixers here. This kit is actually a combination of two frequently purchased attachments—the food grinder and the shredder. The food grinder is ideal for grinding meats for sausages or burgers, and comes with the supplies you need to stuff your own sausage casings. The slicer and shredder attachments can slice or shred vegetables or grate piles of cheese. (Both of which can be mixed into your burgers or sausages.) Think of this as the precursor to the spiralizer. While we love the combo kit because most people end up buying both attachments, you can buy them separately if you prefer. After all, vegetarians might not need the meat grinder and if you have the spiralizer the slicer/shredder combo might seem redundant. One of the trickiest parts about making pasta is rolling it evenly so you end up with noodles that are all the same thickness. The pasta roller makes that simple. Like many of the mixer’s attachments, it hooks into the motor through the knob on the head of the mixer. It also takes a lot of the work out of the process, since you just need to feed the pasta into the roller and catch it on the other side. Flat sheets are great for making lasagna noodles or filled pasta like ravioli, but the set also comes with cutters for thin and thick noodles, so you don’t have to cut the pasta by hand. The pasta can be cooked fresh, or you can dry or freeze it for later use. Homemade pasta is easier with this pasta press that fits any current KitchenAid stand mixer model. It uses the mixer’s power hub to squeeze pasta dough through one of the six included dies to make pasta shapes including spaghetti, bucatini, rigatoni, fusilli, large macaroni and small macaroni. A built-in wire cutter lets you cut the pasta to your desired length, whether you want long strands of spaghetti, medium-length rigatoni, or super-short pasta rings for soup. Along with the disks, this also includes a pusher for sending dough through the press, and a cleaning tool. While the description says this includes a storage case, consumers have noted that it comes in a box, but there is no case. Making ice cream at home is fun, and it allows you to customize the flavors to fit your family’s taste. But since ice cream is a seasonal treat, and stand-alone ice cream makers take a bit of space, you might be reluctant to invest in one. The KitchenAid ice cream maker consists of a freezer bowl that can live in your freezer when it’s not in use, and a paddle that attaches to the mixer to stir the ice cream as it freezes. The bowl fits directly onto the arms of the bowl-lift models, and there’s an adapter included to make the bowl work on tilt-head models. Like other freezer-bowl ice cream makers, this allows you to freeze one batch of ice cream at a time, before the bowl needs to go back into the freezer again. The precise heat bowl can be used while attached to the stand mixer, so you can beat or whip or knead ingredients while keeping them at a precise temperature or while heating gently. You can also use it separate from the mixer, as a slow cooker. This heats from 70 to 220 degrees Fahrenheit, making it ideal for making custards or yogurt, for proofing bread, for simmering soups, or for perfectly tempering chocolate. It has a digital readout and a timer, and a glass lid for use off the mixer. While this isn’t an essential item, it’s great for cooking foods that require a very precise temperature or when you want to hold a temperature for a long period of time. It’s also more convenient than using a double boiler on the stove, since you don’t need to check the temperature with a thermometer—the bowl does it for you. There are two different models; this one fits tilt-head mixers and the other fits bowl-lift mixers.